Do you have a voter ID card but not sure whether your name is included in the voter’s list or not? Don’t worry, you can check that easily. Election commission takes the responsibility of distributing the Photo Voter Slip (PVS) that has the photo, address and polling booth address at your address. As students and working people, there are chances of us unable to collect PVS. You can check your name as well as your polling booth address online easily. 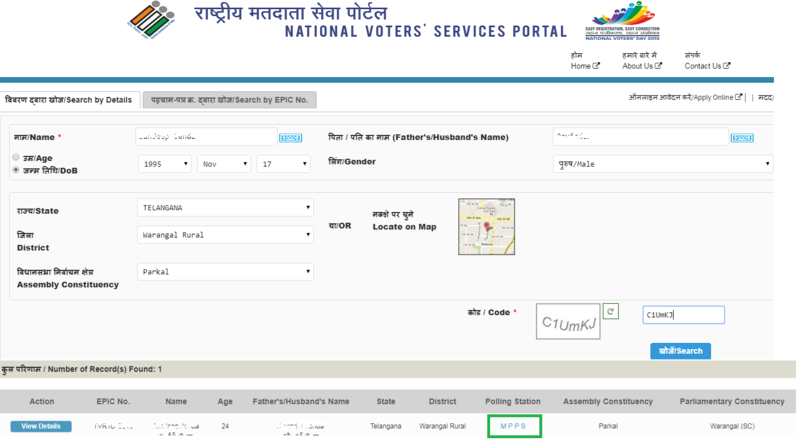 On the national voter service portal, there are 2 options to search for your details in the voters list. One is detail search by providing your name, state, district and assembly constituency. The other option is to search by EPIC number, the EPIC number is the voter card number. Each voter ID card has a unique number. Enter your name as per the voter card that you gave during your registration time. Select the state and your district from the drop down options in the below fields. Select your constituency and gender in the next fields. Enter the Captcha Text and click on search. If your name is present in the voter’s list, you will get the above details. You can find your name and other details along with polling station name and address. Make sure your details are matching. If your name is not listed you will not find any information. Click on “Search by EPIC” as shown in above figure. Enter the EPIC Number and select the state form the drop down options. If you have entered correct EPIC number, then you will get your polling booth details as below. Make sure your details are matching. Once you have the details of the polling booth you can go to the polling booth on the day of election with your Voter ID card. There you will find the concerned Booth Level Officer (BLO), outside the polling station. You can collect the slip from him and vote. Hope this piece of information helps you. This entry was posted on Apr 2014 at 9:50 PM	and is filed under Information. You can follow any responses to this entry through the RSS 2.0 feed. Your Feedback Matters! I had requested to change my constituency but did not know whether it has happened or not. Actually name is still constituency where I lived earlier. This site was very useful for finding this fact. Good work! Thanks for updating with the page with the latest process. I have used your site in last election also. Like the way you present this in user friendly manner. You can search in one of the 2 methods i.e. using your details or your EPIC number at https://electoralsearch.in/ Once you find your name in the list, you will also get the polling booth details. i am registered voter but in the electrol rolls in last general election it was not found,have to link with my Aadhar card. IF no records to display then what to do. HOW TO VOTE NOW? Filled Form 8A for change of Address long time back. Now I have to go 20-30kms to vote.